Virtual War Memorial | The 10th Battalion "Pozieres Cross"
Located behind the South Australian National War Memorial. 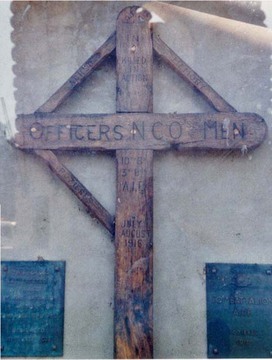 One of six wooden commemorative crosses enclosed behind Perspex in alcoves in the outer face of Government House Domain wall. Below the arms of the crosses are bronze plaques. This cross, in its natural colour is in the form of a Celtic cross except that the joining surround is not circular but straight. The lower left link is missing.